SFBayAreaKoiClub.org - Can aeration be turned off? An interesting question has been asked: “If an air pump is turned off for an hour in the evening, does the dissolved oxygen in the pond water disappear immediately the air pump stops?” (The pond has an aerated bottom drain and I assume the air is being turned off so that the Koi can be seen more clearly). I could approach the answer from a technical point of view but it is much simpler to draw a comparison with a situation that we all have experienced and can relate to. It is a sensible idea, if you feed Koi when the air is off, to bear in mind that as the protein in their food is digested, they produce ammonia. The nitrifying bugs (nitrosomonas and nitrobacter) in the biofilter will soon get busy converting this into nitrite and then into nitrate. 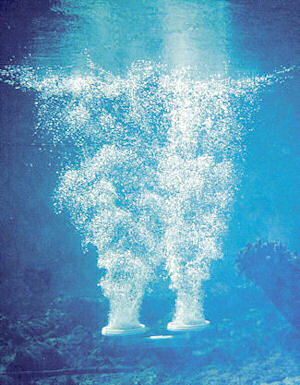 In order to do this, they will use a huge amount of oxygen, which they will also take from the water. Unless there is sufficient continuous aeration in the filters, the water returning to the pond will be depleted of oxygen. As this mixes with the rest of the pond water, it will dramatically shorten the time during which aeration in the pond can be turned off. It is never a good idea to turn off the air supply to the biological chamber of the filter unnecessarily.